Her ship set down on the warm black paved road in front of her great grandmother's house and a group of deer leapt from the nearby field to hide in the woods. The engines shut down and Tonya climbed out of her ship. Humans had left the planet long ago to give it a much needed break. A time to rest and rejuvenate itself. There were way more song birds in the area now than Tonya had seen on the vids and the vegetation had certainly taken over. She waded through the chest high grass that had grown up through what was once a gravel driveway. The posts holding the porch roof had long since deteriorated and the back porch roof hung precariously out over the steps without any support. The things I do for my mother, Tonya thought, gritting her teeth as she tiptoed up the steps afraid to disturb the hanging roof. Tonya tried the handle on the back door and was relieved when the handle turned easily. Pushing the door open gave Tonya her first glimpse of the home her dying mother would give anything to see again. The view would probably crush her, Tonya realized sadly, now appreciating why her father suggested she go instead. Sunlight streamed in through the gaping hole in the roof above that had long since collapsed. Years of rain and rot inspired trees and weeds to grow up through the collapsed floor boards. Green leafy branches reached up to the sky through the living room roof where a ceiling fan had once hung. I hope the back bedroom isn't this bad or else this trip will have been for nothing. Carefully making her way around the debris and rotting floor boards Tonya reached the hallway and found it a little dryer. Her mother had visited here a great many times when she was a kid. She had spent summers with with her grandmother, Tonya's great grandma. The first room off to the right was her grandmother's piano room. She recounted for Tonya how she had sat for hours at the old heavy upright piano while her grandmother patiently tried to teach her how to play. Warm sunlight on the music sheets and the smell of fresh snickerdoodles, the reward for a lesson well studied. Tonya poked her head into the room today to find the upright piano poking our from a large gaping hole in the floor. Sunlight from the window now inspiring weeds to grow up around it from under the house. No doubt the floor joists had collapsed under the piano's weight years ago. I wonder if it could still make the sweet music I heard on mom's vid. Tonya decided that it probably wouldn't and continued onto the next room. Tonya pushed the door open to the guest bedroom and gasped in relief. 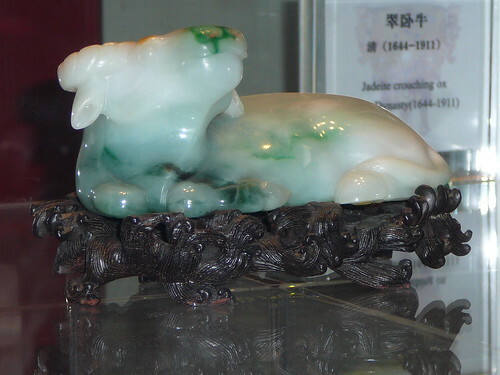 There hanging from a chain on the ceiling fan, still intact, hung the jade fox her mother still so lovingly remembered. ->photo credit: JadeCrouchingOx via photopin (license) <- And yes I am very well aware that the picture is not of a fox... sorry, I'll keep looking. If anyone finds a public domain one or one that I can share with a link back let me know! 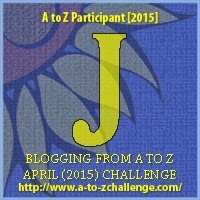 Today's post was inspired by the letter J. J is for: Jade as part of the Blogging from A to Z April 2015 challenge! Click on the letter to join on in the fun! This one tops out right at 497 words. For Readers: What is one thing from your grandmother's house that you would love to have as a keep sake? This was eerie and intriguing. Now I want to know more about the great-grandmother and why humans left the planet. Will they ever come back? Really enjoyed this and will be back to read more! I do have one thing from my grandmother's house that I love: her china cabinet. I was shocked that I got it, because I have a BUNCH of cousins and they all lived near her. Aww that is sweet of her to pass that down to you! Was it willed or did someone just decide that you would get it when everything was getting split up? Thanks for visiting! I'm glad you enjoyed the story! If humans vacate the planet, I'm just gonna have to stay behind and rot with the house. LOL Enjoyed the story. Aww thanks! Thanks for visiting! What a neat story! I love the idea of us leaving out poor planet to allow it to heal. I wonder what life will be like when space travel is so commonplace. I wonder if I would leave. And if I did, where would I go? Happy A-to-Z!